Part-time and full-time employees: realize your higher education dreams through tuition reimbursement! 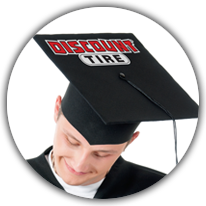 We recognize that your skills and knowledge are critical to the success of Discount Tire / America’s Tire / Discount Tire Direct. The Tuition Assistance Program encourages employees’ personal development through limited reimbursement of eligible education expenses. See complete program rules and application forms on the Knowledge Center under Human Resources > Employment Forms. NOTE: Yearly reimbursement limits are different depending on whether you are full-time or part-time status. Part-time employees must average at least 12 work hours per week to be eligible. Other restrictions may apply.